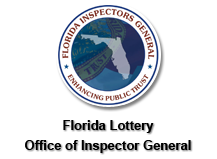 The internal audit activity helps the Florida Lottery accomplish its objectives by bringing a systematic, disciplined approach to evaluate and improve the effectiveness of risk management, control and governance processes. An Assurance Service is an objective examination of evidence for the purpose of providing an independent assessment of risk management, control, or governance processes for the organization. Examples may include financial, performance, compliance, system security and due diligence engagements. A Consulting Service is an advisory activity, the nature and scope of which is agreed upon with the client. It is intended to add value and improve an organization's operations. Examples include counsel, advice, facilitation, process improvement, and training. Internal audit services are to be performed in a way that provides reasonable assurance that work conforms to the International Standards for the Professional Practice of Internal Auditing, the General Principles and Standards for Offices of Inspector General, Information Systems Audit and Assurance Standards, the Office of Inspector General Charter, and OIG Audit Manual. Provide liaison support between external auditors and the agency.